Don’t feel like you need to have the same exact ingredients for your salad. This is where the fun comes in – just use what you have, or ingredients you prefer. Bell peppers would be a delicious addition, as would red onions or scallions. Kalamta olives are always wonderful in a Greek salad. In the summer, when fresh herbs are plentiful, a handful of basil or oregano would add a flavorful, gourmet touch. You can also omit the chicken for a vegetarian option. See what I mean? It’s easy to make it your own. 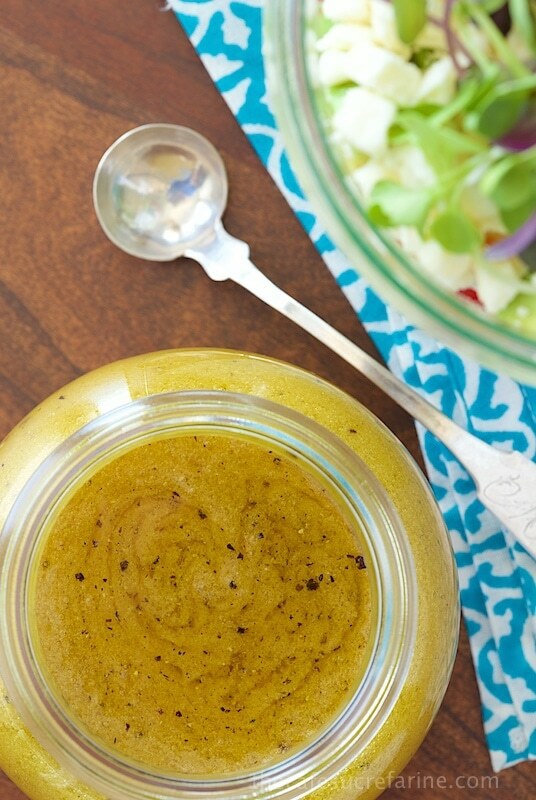 My dressing was inspired by a favorite restaurant here in Raleigh that Scott and I visit frequently, when we need to eat lean, quick and economical. We happened to be enjoying a big Greek salad (surprise, surprise) together, when I noticed one of the staff members refilling the salad dressing bottles. They have their own signature dressing and, while she was making it I zeroed in, watching carefully how she was putting it all together. Before we left, I purchased a bottle of the yummy dressing to take with me so I could compare. When I got home, I tried to imitate the recipe and I think I’m fairly close, or at least have come up with a decent rival! We loved this bright, fresh, healthy salad, and it will definitely have lots of repeat performances here at the Café. I think once you try it, you’ll also be making it again and again. Hey, how about a deal? I won’t call you a stick in the mud if you refrain from thinking about me that way. Fair? P.S. I love to serve this salad, layered, in my Weck jars. This makes for a fun presentation, and guests can simply invert the pretty little layered salad onto their plates and drizzle it with the delicious dressing. It’s easy to make ahead this way, and an added bonus is that because the avocado is tucked between other ingredients, it keeps it’s lovely color till serving time. 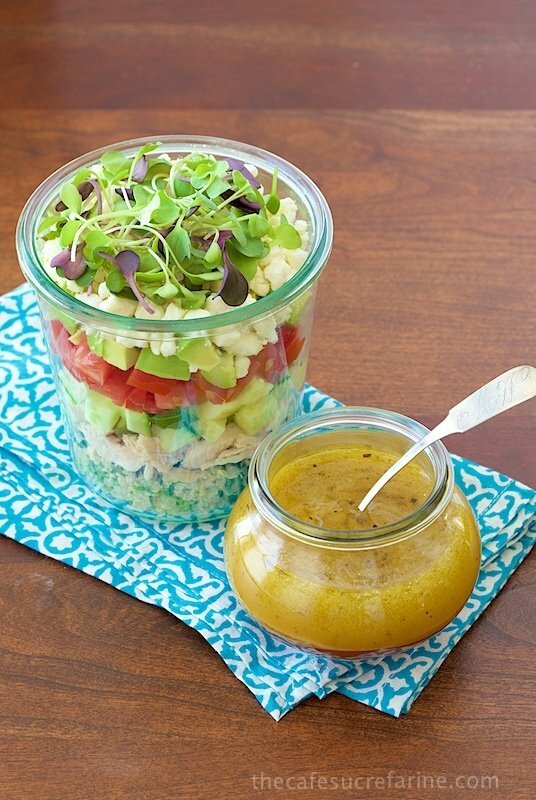 The layering-in-a-jar technique is also a great way to make a portable lunch for work. Super healthy and super delicious! 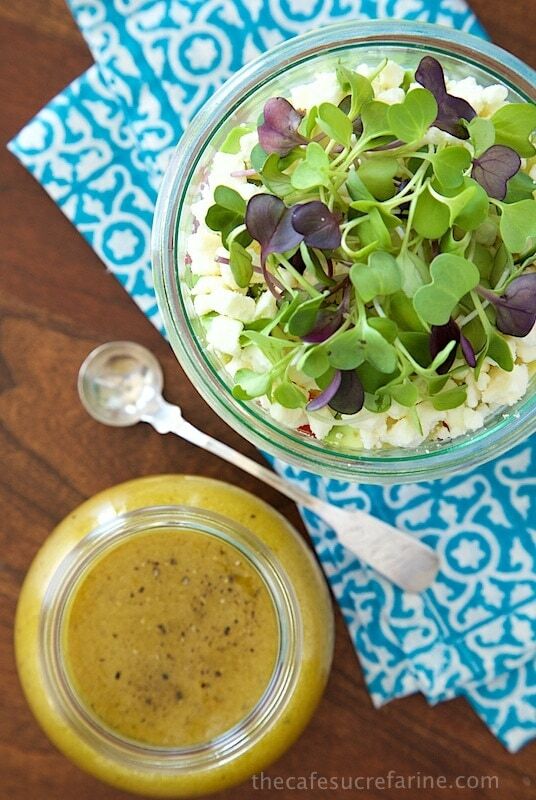 For the dressing, combine all ingredients in a medium-size glass jar. Shake well to combine. Shake again, just before serving. 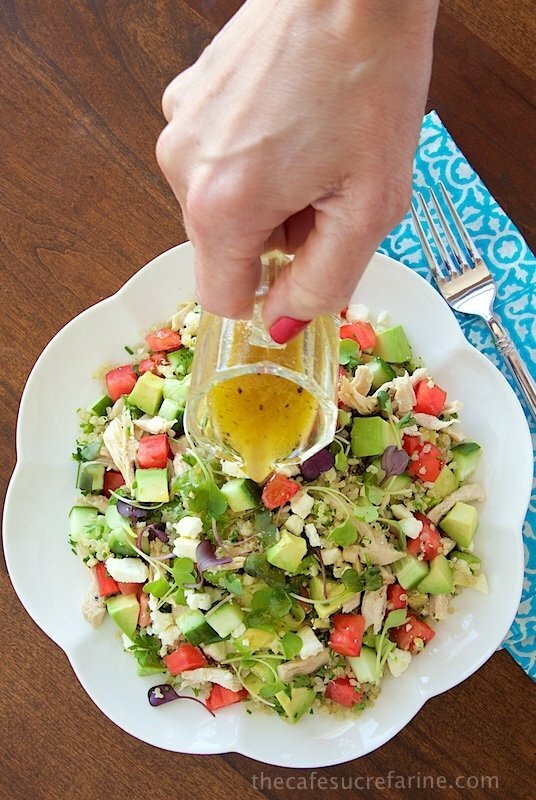 Drizzle the salad lightly with the dressing just before serving. Pass extra dressing at the table. * It makes a huge difference how quinoa is cooked. It can either be wet and soggy or fluffy with delicious individual grains. For a easy tutorial on How to Make Perfect Quinoa check out this post. What a gorgeous and healthy salad. Pinned to try it soon. Now THIS is my kinda salad! Looks soooo good Chris! This does look delicious, but I always wonder why people put quinoa, which is a complete protein, in dishes with meat. Isn’t that kinda redundant? Why bother with the quinoa and why not use rice or barley? I see quinoa as a plant-based protein so you don’t have to use meat . So, I don’t understand why people mix them. It ruins the point of the quinoa being used. Thanks so much for taking the time to leave a comment Shirley. 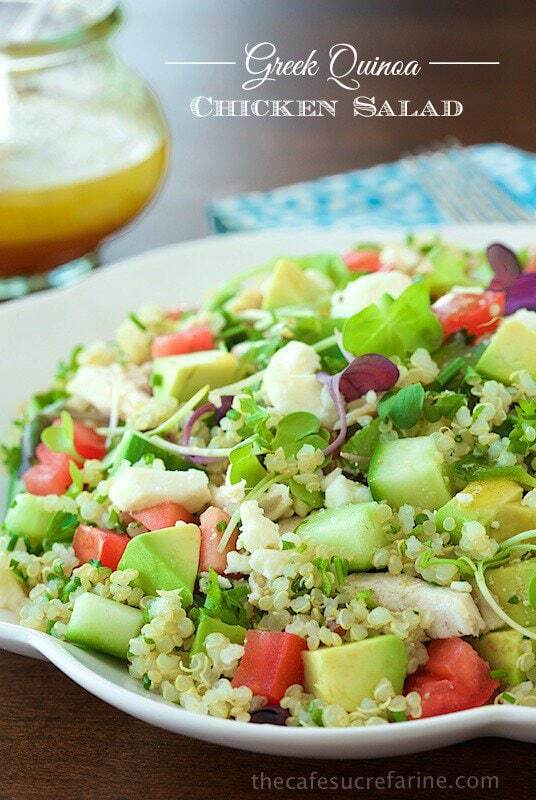 You’re so right, quinoa is a complete protein. But it’s so much more than that. We enjoy the flavor, the texture and love that it has more minerals and vitamins than any other grain. Quinoa is actually known as “the mother grain” because it’s so dense in nutrients. 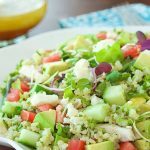 It’s also loaded with fiber and antioxidants and honestly, I don’t mind combining the chicken and quinoa proteins. I agree with the old adage “the more the merrier” in this instance – a meal high in protein keeps me happy and satisfied for hours! I love your salads and salad dressings. This is yet another winner from you! What a delightful quinoa salad! I can always count on you to come up with great salads and you have outdone yourself with this one, Chris. This dressing is quite different from others you’ve suggested. It will be perfect with this type of salad, I agree. Since you are the food blogger who taught me to make Perfect Quinoa long ago, I am staying with your excellent technique. 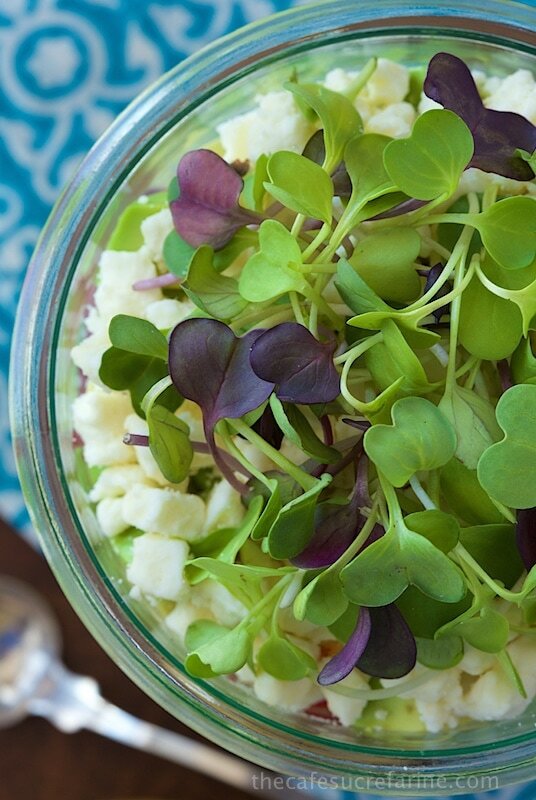 I think the microgreens are a great and pretty addition to this salad – just makes it look special. I have never bothered to buy them before – they are a bit pricey – but I can see how they are such a nice addition. Very nice Post. BTW, when I think of you, the term “stick in the mud” never even comes to mind. It is just beautiful! and I can’t wait to make the dressing, too. i like your little trick with the avocado. I’ve been looking at salad dressing recipes lately and this sounds like what I’m looking for! The salad is lovely. I love to put anything in my Weck jars – they are wonderful and I bet this salad is too. Happy weekend!